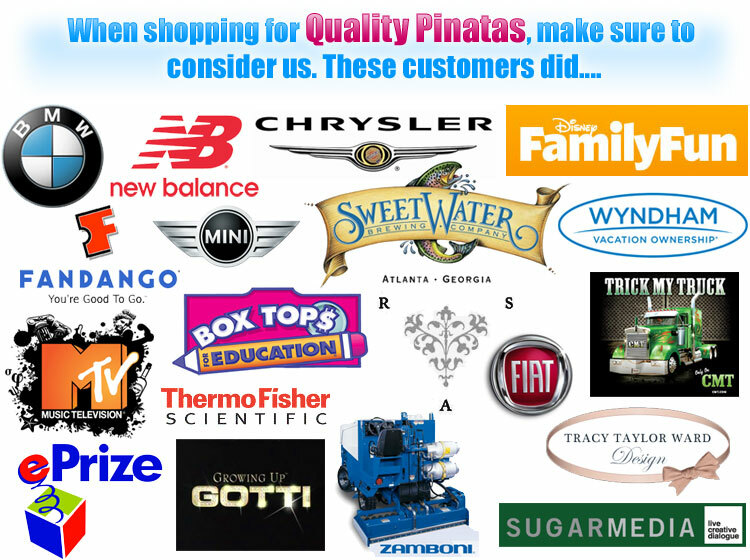 Below are what our satisfied customers had to say about our custom pinata services. If you to have a testimonial that you would like to share please email it to info@fiestapinata.com Thanks for the kind words! I had purchased a monsters inc pinata for my sons 4th birthday. When I came home one night I noticed a HUGE box, at first I didn't know what it was until I read the name on the outside. It was from fiesta pinata. I thought the box was going to be filled with a bunch of shipping material so it wouldn't be damaged, low and behold the pinata was the same size as the box. I took it out of the box and it was the same size as my 4 year old. He loved it!! As I sat in amazement I notice in the back it was ripped. Now, I went from amazement to panic mode because his party was a couple of days away. The next morning I called and not only did I talk to a customer service rep, but to the owner herself. I told her my situation and on how wonderful the pinata was but it was ripped and his party was in a couple of days. She told me not to worry she will ship one out that same day overnight and I would have it by Thursday. She told me when the delivery guy came to give him the ripped one. ! Well, Wednesday I get home and notice another big box. They were a day early, (which was great) but now I had 2 big boxes in my house! I called her back the next day and she told me where I could go to send it back, and they would handle the charges and shipping costs. Well, the day of the party everyone was amazed at the pinata, the all thought it was a doll I had standing in the corner, until I told them what it was. When it came time to do the pinata game, I was even more impressed because each kid (about 10-15) including the older one hit this thing about 5 times each and it still wouldn't break. When last year I purchased one at a party supply store and my son since it was his birthday got to go first and he broke it. Anyway, I know I'm going on too much about this, but this pinata was worth every single sent and next year I will be getting another one from them and I told everyone I know about fiesta pinata. Thank You very much for such and amazing pinata!!!!! - J.G. Got it! It's INSANE. Amazing. Really thrilled with it!!! Thanks so much. -Abbe M.
We ordered a General Lee pinata for our sons 4th birthday. When we received that pinata it was more than we expected it I knew our son would not want to bust it. When the big day came all the kids LOVED IT and our son after we busted it wanted to keep it and my husband too can't bring himself to throw it away. I definitely recommend fiesta pinata to all my friends and anyone one that wants to add the special something to your celebration. Thanks Again!!!!! - Sarah R.
The pinata was a huge success. Thanks! - Philippa C.
Hi, I got my piñata today it is so amazing!! Thank you so much... -B.G. Thank you for accommodating my needs for a special order Ninja Turtle pinata. My son was absolutely thrilled when he saw it!!! -J.S. Thanks so much for your help!! -S.R. Fiesta Pinata, It was a pleasure speaking with you, thanks for the prompt service. -T.H. Wonderful customer service. I will purchase future pinata needs from Fiesta Pinata -L.M. Very friendly and helpful customer service representatives! Thank you! -K.L. I would just like to thank fiesta pinata. Their pinata definitely made the party. I certainly appreciate all the effort put forth by the staff. I would highly recommend Fiestapinata.com and look forward to future business. -D.L. Hi -- Just wanted to let you know that I received the piñata today--it is AWESOME!! Great job to all involved--I will personally call to thank you this week. Best regards-- -M.C.